Steve Grace is an exciting and vibrant Australian singer/songwriter with a heart for world evangelism. 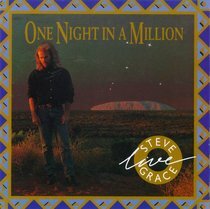 Twenty years ago, Steve Grace was driving trucks. Answering the call of God, he pioneered a concert ministry that has taken him to hundreds of cities and regional towns throughout Australia. Steve's vision soon developed into an international ministry with opportunities each year to perform at concerts, festivals and crusades before thousands of people in nations across the globe. This humble ministry has been used by God to see many come to a genuine faith in Jesus Christ and many inspired to take up the challenge of living life in the grand adventure God has called us to. Over the years Steve has shared the stage with artists like Michael W. Smith, Steven Curtis Chapman, Rich Mullins, Amy Grant, Carman, Randy Stonehill, Phil Keaggy. And more recently, Steve has become a featured artist at crusades conducted by evangelists like Greg Laurie and Franklin Graham. For Steve, his ministry is very much an adventure led by God, and strongly supported with huge steps of faith from his family, Kerrie (his wife) and their three sons, (Cheyne, Ryan and Jordan).